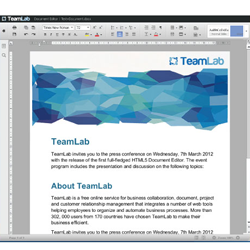 Ascensio System SIA introduces the beta version of the first full-fledged HTML5-based TeamLab Document Editor. Ascensio System SIA, the developer of IT solutions for corporate use, reveals details on TeamLab Document Editor, a part of the web office for business collaboration, project, and customer relations management. With the unique technology applied and functionality significantly enhanced TeamLab offers a full-fledged feature-set to maintain document procedures online at a completely new level not yet reached by other manufacturers in the segment. no language barriers as the number of fonts is maximum with hieroglyphs included. Pursuing a goal to erase boundaries between desktop and online word processors, TeamLab Document Editor combines the convenience and mobility of web applications with the multifunctionality of conventional package doc processors like Microsoft Office Word or OpenOffice Writer. The introduction of TeamLab Document Editor will take place during the press-conference on Wednesday, 7th March, 2012, 15:30 – 16:30, Room 3B in the Convention Center (CC), CeBIT 2012, Hannover, Germany. If you would like to attend the press conference, please notify us at pr@teamlab.com. TeamLab is a free online service for business collaboration, document, project and customer relationship management that integrates a number of web tools helping employees to organize and automate business processes. Ascensio System SIA is the developer of IT solutions for personal and corporate use, founded in 2009 with the idea to make any teamwork and small business activities efficient. Currently, the company's flagship project is TeamLab. Its development is led by a multi-national team of ambitious and high qualified experts in web application design and implementation.